The airborne dust is drawn into the filter by a fan along a distribution chamber. This chamber ensures an even flow of air through the filter cartridges and decelerates the air stream. This reduction of speed coupled with the physical change of direction, ensures that the large particles are separated from the air stream. The air stream containing the remaining dust is drawn equally onto the outer surface of the cartridge pleated polyester filtration elements. The dust is retained on the surface and the air permeates through the filter media to the inside of the cartridge(s). It is then discharged via an (optional) fan set either into the factory or to the atmosphere. Eventually the dust retained builds up to form a dust cake which effectively improves the collection efficiency of the filter, with a resultant increase in resistance to air flow. To maintain the air flow at the design volume rate, it is necessary to clean this collected dust cake from the surface of the filter media at regular intervals. Cleaning is achieved by injecting a short pulse of compressed air into the central internal column of each of the filter elements in turn, against the normal direction of flow of filtered air. This pulse of compressed air momentarily raises the pressure internally to a level greater than the external pressure surrounding the filter element. The higher internal pressure causes a flow through the cartridge in a direction opposite to the normal air flow. This dislodges the accumulated dust cake from the filter media surface. The effect upon the filtered air flow is virtually negligible, since this method of cleaning a cartridge is achieved instantaneously. 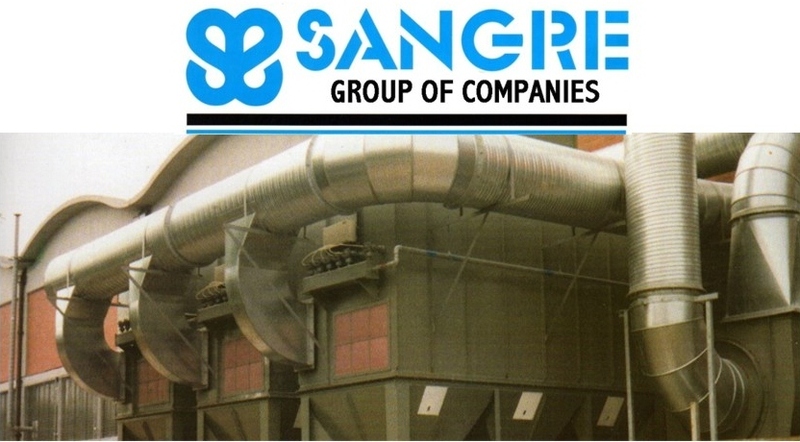 Thus the Sangre filter provides for a continuously rated service. The delivery of compressed air is maintained by a solid state sequence timer activating two way diaphragm valves via solenoids. A minimal volume of compressed air is required which should be filtered, dry and free from oil, to clean the unit. Air pressure delivered to the unit should be between 5.5 and 6.9 Bar (G). The dust is collected in a removable bin(s) below the hopper section(s) of the filter. Alternative collecting methods are available for dust discharge, including the use of rotary air seal valve; or indeed a screw conveyer system. Air volumes between 1,000 m3/h and 25,000 m3/h on single units larger air volumes using modular design. CF Cartridge brochure is in Adobe Portable Document Format (pdf), you can download Adobe Acrobat Reader X10 for free from the Adobe website.